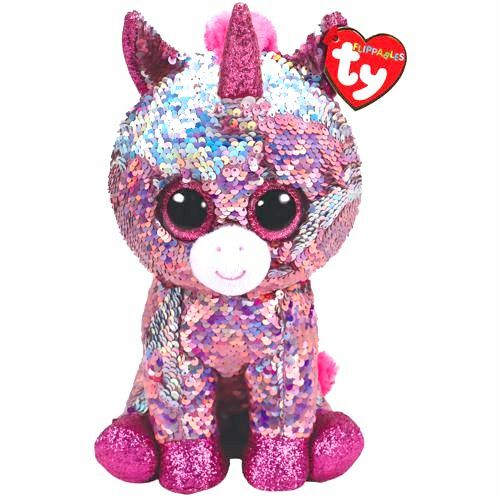 Sparkle is a unicorn covered in flippable sequins that alternate between pink and iridescent silver when you run your hands over them. She has large, glittery pink button eyes and a white muzzle with a pink stitched smile and nostrils. The inside of her ears and her hooves are sparkly pink and she has a sparkly pink horn on top of her head. She has a bright pink fluffy mane and tail. Sparkle was released in June 2018. Sparkle is part of the Ty Flippables range that have reversible sequins that change colour when you run your hands over them. This is the small 6″ Flippable version of Sparkle. She was also released as a medium 9″ Flippable.